A scant 200 million years ago, when dinosaurs first began coming into their own, a valley in what is northeastern Arizona received and buried any number of trees. During the course of many millions of years, water rich in minerals trickled down through the ground; these minerals replaced the wood. In some cases, logs were replaced whole, the entire form memorialized in quartz. In others, fossilization was as fine as a cell-by-cell replacement. 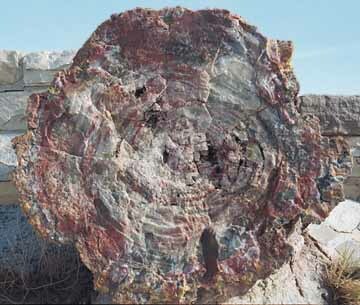 Eventually the upper layers of sediment were eroded, and today we have a beautiful petrified forest. The park itself has an internal road some 15 to 20 miles long, from which one can make several marked stops. Different sections of the petrified trees are named as forests, so one can begin at the Rainbow Forest and work your way north to the Crystal Forest, which has a quarter-mile walking trail. If you enter the park on the south, the Rainbow Forest Museum provides a good introduction. By the Crystal Forest walkway.